New York City bus riders are about to experience what London riders do: the double-decker bus. Andrew Siff reports. New York City bus riders are about to experience what London riders do: the double-decker bus. It's part of the MTA's Bus Action Plan announced on Monday to improve deteriorating service, and MTA President Andy Byford says there will be several initiatives to address issues with speed, reliability and modernization. 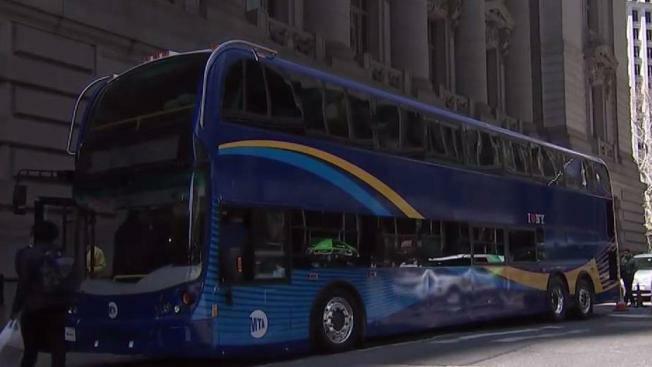 In addition to double-decker buses, the MTA is looking into a “tap and go” fare payment, new all-door boarding procedures, as well as new routes and schedules, including more for off peak service. The double-decker pilot program will be tested on express buses from Staten Island. These bus routes known for their “X” designation in their names, will now be known as “SIM” routes, or Staten Island-Manhattan Express routes. The city has long been dealing with transit issues, including a bus travel time of about 5.7 mph — the slowest travel rate in the nation, according to transit executives. These buses only exceed 2 mph about half the time. Early this year an advocacy group known as the Bus Turnaround Coalition published a report that said that nearly 75 percent of the city’s 246 bus routes got failing or barely passing grades because they were painfully slow and unreliable. The group said transit officials need to rethink the city's bus routes and redesign buses and city streets to make service more efficient. "I and my management team will expect to be held accountable." But he also preached patience. While the double-decker is expected to hit Staten Island next month, many of the other changes, including the tap-and-go payment system, are still two years away.